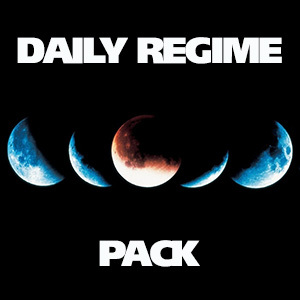 Details: Years in the making, the Daily Regime Pack is a full daysâ€™ worth of dosing. Intended to be used together, at the start, during and end of you day- the daily pack is everything you need to get started with a daily dosing regimen including 5 doses intended to be dosed on a daily basis: After Awake for the morning, Focus and Timelapse for during the work or school day, and Unwind and Lullaby for the evening and before bed. Everything you need to get started in daily dosing!